There’s something very comfortable about a decent RPG; several elements are invariably laced through the genre that makes settling into a new game something easy and familiar. You might be setting out on a new adventure, but the core will always be the same. Half-Minute Hero: Super Mega Neo Climax Ultimate Boy (try saying that ten times fast!) plays on this familiarity to create something that’s new and interesting, while still maintaining the core that makes it unmistakeably an RPG. It plays on the idea that it takes dozens of hours to really play your way through an RPG – hours filled with grinding battles, leveling up and pouring over equipment to decide whether that armour works best with your finely tuned aesthetic. All this is present in Half-Minute Hero, but there is a catch: you have only 30 seconds to save the world. This can’t end well. In actual fact, it does end rather well. Rather than coming off as gimmicky and shoe-horned in, the time-limit actually freshens up a routine that you never even noticed growing stale. Of course, half a minute is never going to be enough time, but thankfully, you aren’t strictly held to that schedule thanks to the Time Goddess – Half-Minute Hero’s core mechanic and most important character all rolled into one. The Time Goddess has the ability to wind back the clock and replenish your time, but that ability comes at a price. Quite literally, in fact, as every time you want to engage her *ahem* services, you have to pay her with your hard-earned gold. Do this with caution though; every time you do it the costs of doing so rise in future. If you make the mistake of lingering on a particular stage you’ll quickly find your funds disappearing almost as fast as your time. The other price you have to pay is the other half of this title’s core mechanic – at the end of each level you have to hand over all the money and experience you earned over the course of the stage to the Time Goddess, meaning you go into the next one back at level one and with a paltry amount of funds to your name. It’s not too much of an issue though, as leveling up and collecting cash is a painless process. Where once you could spend a dozen hours in a game just grinding your way through hundreds of encounters to boost your level enough to take on whatever particularly tough enemy was hindering your progress, Hero – the imaginatively named main character – levels up in a matter of seconds. This is where the combat – such as it is – comes in. The Hero sprints through the world like his pants are on fire and combat is no different. Completely automated, combat is pretty much the Hero running straight through whatever gets in his way. The lack of input on your part is irritating, but watching him blitz through a bunch of tough enemies can be very satisfying. He gathers funds faster than a corrupt banker as he does so, meaning that it’s seldom tough to afford anything in the game’s world. Buying things is something that you’ll likely do plenty of throughout, as the only things you get to keep after a successful stage are the things you have equipped. It’s a nice touch, allowing the player to be rewarded for progressing, as well as ramping up the difficulty over time. It also allows for another RPG staple – perusing your equipment to decide what to wear. Each item has an effect on a bunch of different stats, such as speed, attack and defence. Speed is of vital importance to the Hero – perhaps unsurprising considering how much time he has to save the world. After all, if he was to slow down then taking down the Evil Lords would be so much harder. 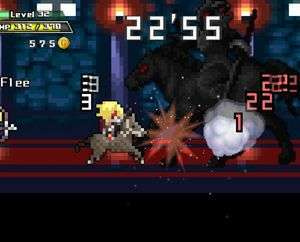 The Evil Lords are a series of bosses that Hero has to eliminate in order to save the world. Each casts a destruction spell, which will end the world in 30 seconds unless our Hero gets in their way. They have all been taught the spell by the main antagonist, a charmer who goes by the name of Noire. His motivations are hardly clear, but he’s out to destroy the world, regardless. Noire is perhaps one of the best examples of everything that is both wrong and right about Half-Minute Hero. On the one hand he is a classic RPG villain – powerful and overarching. He’s more in the know than Hero, he’s mysterious and, most importantly, he’s the vessel of a higher power – everything a villain could ever want to be. What more could a man ask for? Well, actual character for one. Despite the fact that Noire is a comforting RPG trope, that’s all he is. There’s nothing there to flesh out his character, which is a distressing trend. Almost every character you come across is a vapid air-head, and there is seldom anything to make them interesting or engaging; occasionally there is a flash of brilliance, but for the most part you’re dealing with lifeless parodies that are actually pretty dull. 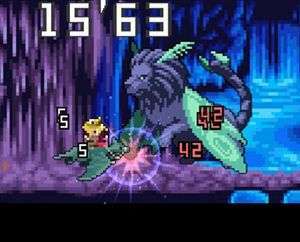 On top of that, things can often blur into repetitiveness, especially during the earliest levels; the first ten or twelve stages are clearly meant to familiarise the player with mechanics and the idea that they only have thirty seconds to save the world, but the lack of variation begins to grate after a while. No matter how quick the grinding is, it’s still grinding and it has its dull moments. Thankfully, things perk up a little later, and after completing the bulk of the main game there are a few brilliant little interludes that really spice things up. My personal favourite allows you to play as an Evil Lord that you’ve previously defeated, and there’s even a retro-graphics mode that I actually preferred to the original graphics. These modes spice things up nicely, but in the end they’re really more of the same and a bit of an attempt to lengthen proceedings a bit. Thirty seconds might not seem all that long, but apparently it’s more than enough time to save the world and have fun doing it. Half-Minute Hero is a wonderful pastiche of the RPG genre, as well as a pretty good role-playing game in itself. I do kind of wish there was a little more variation, but there’s still plenty to cut your teeth on and much enjoyment to be had. There are a few problems, but those are glossed over for the most part by the clever core mechanics. One thing I will say is that there are occasionally incorrect button prompts, one of which led to almost an hour of frustrated restarts before mashing my way to the correct key. That aside, I had few problems in smashing my way through bosses and saving the day. 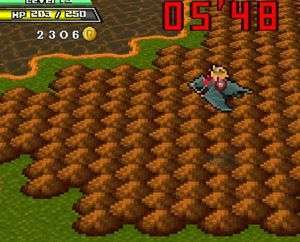 Despite the occasional irritating flaw Half-Minute Hero was still fun to play; I loved watching my levels tick up as I sprinted my way to the boss at the end of the map, and I enjoyed the constant light-hearted ribbing directed towards more serious RPGs. A few rage-quits here and there mean nothing between friends, and Half-Minute Hero and I have come out of this pretty friendly. There are a few issues still hanging around, but at the end of the day it’s all a bit of fun.